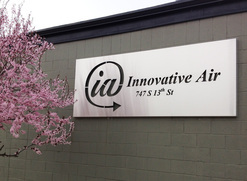 Innovative Air, Inc., located in Boise, Idaho, was founded in 2003, and is Idaho's leading representative of high quality, innovative HVAC products. Our focus is on green, energy efficient systems and unlike the typical Rep firm, we are unique in that we sell Air Side Equipment, Wet Side Equipment, and HVAC Controls. Additionally, we maintain a Start-up Department that makes sure that all of our projects get installed and started correctly. Innovative Air has a vast array of products, which means that we have a product for every type of system and can give knowledgeable advice to our customers as we accurately compare these systems. Give us a call and let us find the right product for your mechanical project. After earning a B.S. in Marine Engineering at the United States Merchant Marine Academy in 1993, George sailed on the ocean for a few years. He then became a Manufacturer's Rep in New Jersey until he couldn't stand NJ anymore and moved as far away as he could to Oregon. In 2003, AAON called up George and convinced him to move to Boise and start his own Rep firm, thus Innovative Air was formed. After graduating from Iowa State with an Engineering Degree, Kerry worked for 2 years in Kansas City, Missouri. After working in Missouri Kerry moved to Boise where he has worked for the last 14 years and 13 of which he has been an HVAC Consultant. A few major projects in Kerry’s portfolio are the design of the HVAC system in our own Boise Airport and designing the HVAC system in our own Innovative Air office when we underwent a major office expansion after we hired him in June of 2006. When not diligently working Kerry enjoys wood working, fishing, and skiing. Cameron has been with us since June of 2009. He has worked in sales in the HVAC industry for the last 16 years. In 2001, he started in the HVAC Industry with a rep firm in Utah, then moved to the Treasure Valley in 2006, and has worked and lived here ever since. His main focus with Innovative Air has been developing our wet side product offering so we can offer a full range of quality products to meet the needs of all our engineers, contractors, owners, and end users. In his spare time he enjoys golfing, skiing, and spending time with his family. Jerry has been in the HVAC industry since 1976 and in 1983 even started and ran his own HVAC rep firm. Jerry came to work for Innovative Air in 2010. When asked why he decided to work for Innovative Air he said, “Innovative Air Inc., has offered me the opportunity to work with a company which is at the forefront of new technologies in our industries.” While not at work Jerry enjoys time with family and friends especially his daughter Lindsey and his son Ethan. While not spending time with family Jerry also enjoys wood working. Jason is a graduate of Walla Walla University’s School of Engineering. After graduating with his Mechanical Engineering degree in 1992 Jason returned home to Idaho and worked in the manufacturing and fire protection industries before taking over the family home building company that his father started. Jason has spent the majority of his career as a business owner but now enjoys the freedom of working with Innovative Air. Jason is married to Kasondra and together they have two active boys. Jason and his family enjoy the many outdoor activities that Idaho has to offer. Jason is an avid road and mountain biker and loves to backpack with his family in the beautiful Idaho wilderness. Keith is a graduate of Boise State University where he attained a Bachelor’s Degree in Business Administration. He comes to Innovative Air with 5 years of experience as a plumbing/wet side project manager and 5 years of experience as the owner of a fire protection company. Keith’s main focus is directed at the further growth of our Wet Side Division. In his spare time, Keith and his wife Amber enjoy traveling with their 3 wonderful kids: Kade, Jonny, and Lexi. After graduating from the University of Idaho with a B.S. in Mechanical Engineering Travis moved to Boise and spent several years working as a field engineer and special inspector for commercial construction. In 2012 he joined the Innovative Air team and has been a great addition, helping to expand business in the lodging, multi-family, and commercial markets. Outside of work Travis enjoys time with his wife, Johanna, and their two children, Alex and Dominic, and taking advantage of the great outdoors that Idaho has to offer. Prior to joining in the Innovative Air team in spring of 2016, Ethan spent five years as an Account Manager for an HVAC systems component manufacturer. His experience with sales, support, manufacturing, logistics, training, and technical diagnostics, makes him a well-rounded addition in his role as Inside Sales. Ethan enjoys staying active in his spare time with a variety of sports and activities, as well as enjoying down time with family and friends and constantly seeking to further his knowledge and varied skills. Vincent entered the HVAC industry in 2013 as a regional Account Manager for an HVAC components manufacturer. In the early spring of 2016, Vincent joined the Innovative Air team as an Inside Salesman. Outside of work Vincent enjoys hunting, fishing, and powersports. Mike has been involved in the mechanical construction industry for nearly 40 years, working as a plumber, HVAC technician, Regional Technical Support Supervisor for York, and has led HVAC controls contracting and equipment sales organizations in Boise, Las Vegas, and Denver. Mike joined the Innovative Air team in 2014 as an outside salesman calling on engineers and design-build contractors. Ryan started his HVAC career in 1996 after finishing school at ISU in Pocatello, ID. Ryan got his start in Consulting Engineering and spent 10 years working for several private consulting firms in Boise. Ryan also taught evening classes at Boise State University’s College of Technology in Mechanical Drafting and Design. In 2007 Ryan made the transition from Design Engineering to Manufacturer representation, working in direct sales, and then as Manufacturer’s Rep. Ryan enjoys spending his free time with his family playing in the Idaho outdoors, and cheering on the BSU Broncos. In 2007, Innovative Air decided to start a new controls corporation. Tom came highly recommended and came to head Innovative Controls in February 2007. Tom's 20 years of experience working on ships in the US Navy has given him a great foundation in controls and he has been a great asset to our organization. While not working Tom is an avid hunter, fisherman, and horseback rider. Lisa comes to us as a journeyman electrician with 27 years of experience in the controls industry. Lisa has installed HVAC controls on many projects around the Treasure Valley including BSU Sky Suites, BSU Football Locker Complex, Norco building, Mountain Home AFB, Cabela’s, Boise Airport and Scentsy. In her spare time, Lisa Enjoys the outdoors and team roping. Michael has been with us since February of 2017. He has worked in service and technical support in the HVAC/R industry for the last 15 years. He graduated from Minnesota State Technical College and moved to Idaho in 2004. Since that time Michael was employed as a service technician for a very busy residential/commercial HVAC/R company. The last 9 years he was a Field Supervisor/Technical Support Specialist for Honeywell focusing on Energy Efficiency and Demand Response. He is excited to be a part of the Innovative Air team and to expand his knowledge of the industry because of IA’s expanding focus on new technologies and customer service. In his spare time Michael likes to spend time with family, fish, hunt, play hockey and enjoy all the outdoor activities Idaho has to offer. Brian began working in the HVAC industry in 1995 and in 1999 he graduated from BSU’s HVAC Apprentice program. With over 20+ years of experience in the HVAC industry, Brian has worked in all aspects of commercial HVAC from installation and service to project management. Brian felt that IA’s expanding focus on cutting edge technology and customer service would give him the opportunity to grow further in the industry. In his spare time Brian likes to spend time with his family, hunt, fish, ride horses and snowmobiles. Laura joined Innovative Air in 2013 as our Office Manager after relocating to Boise from Memphis, TN with her son, Shawn, while he completed his Masters at Boise State. Laura, a CPA, brings 30+ years of accounting and operational experience to IA. In 2017 Laura relocated to Nashville, TN and now functions remotely as our Accountant supporting our IA team. In her free time Laura and her husband spend as much time together as possible with their twin grandbabies, and travelling and cheering on their Auburn Tigers. Charity joined the team at Innovative Air in 2016 with 7 years of prior office management experience. Before that, she had spent 6 years in Romania helping to establish a NGO for the impoverished Roma community in two small villages. Charity was born and raised in Boise, ID and in her free time she loves spending time with her husband and two kids, hiking, enjoying the outdoors and playing volleyball. Bill is responsible for our warehouse, receiving, and deliveries.